Unsecured loans allow you to borrow money for almost any purpose. You can use the funds to start a business, consolidate debt, or buy an expensive toy. Before you borrow, make sure you understand how these loans work and the other alternatives you may have available. A lender that offers you an unsecured loan won't require any property or collateral to secure or guarantee the loan. With a secured loan, such as a mortgage loan, the loan is secured by property. If you don’t repay the loan, your lender has the right to sell your home and collect what you owe out of the sales proceeds. With unsecured loans, nothing specific has been pledged as collateral. This makes them a little less risky for you, the borrower, because the consequences are not as immediate if you fail to repay. Lenders, on the other hand, take more risk with unsecured personal loans. They don’t have any property to sell if you don't pay the loan, but they have other options available if they want to pursue repayment—such as, for example, taking legal action against you and attempting to garnish your wages. Because lenders take more risk on unsecured loans, they generally charge higher interest rates than they for secured loans. Your credit is one of the most important factors in determining whether you’ll receive an unsecured loan. If you have good credit, you’ll pay lower interest rates and have more loan options available to you. With bad credit, you won't have as many choices, and you may need a co-signer to get approved for a loan. Whenever applying for a loan, it's a good idea to learn more about how credit scores work. Lenders offer several types of unsecured personal loans, and each one comes with tradeoffs. Look for the loan that best meets your needs while minimizing your costs. Signature loan: This is the most basic type of unsecured loan. As the name suggests, the loan is secured by nothing but your signature, or your promise to pay. You can find these loans through banks and credit unions, and you can use the money for any purpose you desire. They are generally installment loans that amortize over time, so you borrow one sum of money and pay it back with a fixed monthly payment until you've paid off the loan. These loans make a good choice if you’ve got good credit because they generally have relatively low interest rates. Signature loans can also help you build credit so that borrowing becomes easier and less expensive in the future. To get a signature loan, tell your bank that you’d like to borrow money using a personal loan. 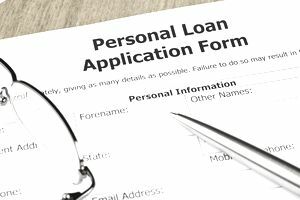 Personal line of credit: A personal line of credit is another form of an unsecured personal loan, but instead of taking the entire loan proceeds at once, the bank will approve you for a certain amount that you can use and pay back as needed. For example, you could have a $15,000 unsecured personal line of credit and draw $5,000 of it to use for payment on an ongoing home renovation project. While you're paying off the $5,000 loan, you still have another $10,000 available in case an unexpected or large bill comes up, for example. As you pay down the balance, the line of credit becomes available again for you to use. You only pay interest on the portion of the credit line that you've borrowed, and you may be able to get a lower rate than you would with a credit card loan. Credit cards as loans: Using credit cards is a form of borrowing for many people. When you use a credit card, you don’t get a lump sum at the beginning of the loan, as you do with a signature loan. Instead, each time you use your card, you effectively borrow whatever you need whenever you need it, as you would with a personal line of credit. If you need more money at a later time, you can charge more to the credit card up to your credit limit. Credit cards make a popular solution because once you’re approved, you can borrow money practically instantly. Unfortunately, you'll generally pay a quite high interest rate on credit cards. Sometimes you can get a teaser rate and borrow at zero percent for a while, but those rates eventually end. It’s easy to get in trouble with credit cards, finding yourself paying hundreds of dollars monthly in interest charges alone. To use a credit card as a loan vehicle, check your mailbox, which is likely full of offers if you have good credit. You also search for online credit cards that offer zero percent or low-percentage-rate deals. Peer to peer loan: This newer type of funding allows you to borrow from individuals, as opposed to borrowing from a traditional lender such as a bank. Several websites allow you to post a loan request online, and people have the opportunity to step in and fund your loan. These loans, like signature loans, generally have fixed-rate installment payments and competitive interest rates. They also allow you to borrow a decent amount. However, your credit score still remains a factor in most cases. To get a peer-to-peer loan, try visiting one of the popular P2P lending sites, such as Prosper.com or Lending Club. Student loans: These unsecured loans offer education funding to students. They’re often a good choice because student loans have features that you can’t find elsewhere, such as flexible repayment options, grace periods, interest subsidies, and more. With some loans, it doesn’t even matter if you have good credit. The only hitch with student loans is that you have to be a student. To get a student loan, start by visiting the financial aid office at your school. The folks in that office, who work with these loans every day, will guide you through the process of completing the paperwork involved and help you understand your options. Which Loan Makes Sense For You? Student loans have reasonable interest rates and most individuals can likely qualify as long as they're enrolled in courses at an accredited college-level institution. These loans offer a longer repayment term, and also typically have a grace period before you need to start payments. However, you may only use these funds for tuition and related school costs. Signature and peer-to-peer loans offer funds at reasonable interest rates, and you might be able to find more attractive interest rates through a credit union or your bank, especially if you have funds on deposit. These loans often let you borrow from $1,000 up to $35,000 with a three-year repayment term. You may have trouble getting approved if your credit score falls into the "fair" category or below. Credit cards and personal lines of credit can provide funds for many borrowers, although the lower your credit score, the higher interest rate you'll be charged to compensate for the repayment risk you represent to lenders. People with good to great credit can take advantage of credit card issuers' zero percent offers, although these usually expire after 12 to 18 months. Since you only borrow and pay interest on the actual amount of money you use, these loans may be more attractive and cost-effective for your personal situation. You may not be able to qualify for a larger loan if you don't have enough monthly income to support the lender's requirements. Getting an unsecured loan when you have bad credit may be challenging, but it's not impossible. You'll have fewer choices and will likely pay higher interest rates than a borrower with good credit. If you’re having a hard time borrowing, learn about getting an unsecured loan with bad credit. If it's feasible, hold off on borrowing until you've built your credit up to the point where you can get loans on more attractive terms. You can strengthen your credit by borrowing and repaying loans, and even small loans can make a difference. If you currently have a low credit score, be proactive about rebuilding it. Try a small loan secured by cash in the bank to get some momentum.